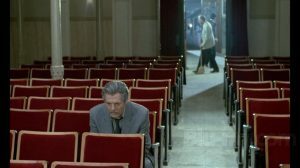 Forget Cinema Paradiso, this is the bittersweet valentine to the cinema deserves! Jordan (Marcello Mastroianni) grew up at his father’s movie theater, and after World War Two, he took over as the theater’s manager. In those halcyon days, the theater was so popular that police had to be hired to keep the crowds waiting to get in from rioting. Now, however, the theater is losing money and is in danger of being torn down.